Many experts agree that October is an excellent time to overseed lawns. Overseeding can give a lawn many benefits such as a fill-in turf damaged by summer stress, a thicker lawn in the spring, and enhancing the ability to fight insects and disease. Overseeding is simply a process of spreading seed over already existing grass. 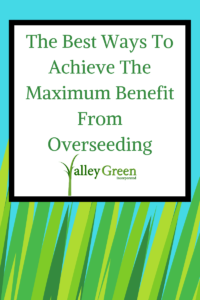 In this week’s article, we will list the best ways to achieve the maximum benefit from overseeding. 1 Make sure you complete the overseeding process by October 15th. Any later than that and you will run the risk of the seeds not taking root before the winter sets in. 2. Mow the lawn to a height of 1.5 to 2 inches. This will assist in the new seed in growing without competition from the other grass and weeds. 3. Aerate the lawn before overseeding. It loosens the soil and creates a better environment for the grass to grow in. 4. Be sure to dethatch the lawn before applying to seed. Using a rake to dethatch dead organic material will ensure the seeds have a good environment to germinate in. 5. Water the lawn completely right after overseeding. Continue to water 3 to 4 times daily after the initial overseeding. Once the grass is established, water for longer times less frequently. Valley Green is a full-service distributor of turf grass & forage seed. We have been providing New England with the top NTEP quality seed since 1990. With locations throughout New England, Valley Green can provide you with the perfect blend. Varieties and mixes vary and are subject to change. Contact your local sales representative to hear about our stock seed mixes or inquire about your own custom blend. Check out our products page for more information. We carry the following mixes.